My visit is always very positive. However I hope in the near future she is able to open an office ata different location . My visit is always very positive. However I hope in the near future she is able to open an office at a different location . The midwife who treated me was super nice. However, did not like the receptionists and Dr. Isolda's care (or lack thereof). 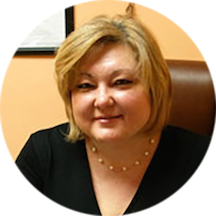 Isolda Tsapok is an accomplished and devoted OB/GYN serving the city of Staten Island, NY. Originally from Ukraine, Dr. Tsapok earned her medical degree from the St. George’s University School of Medicine in Grenada. She completed her residency in obstetrics and gynecology at the Long Island College Hospital in Brooklyn, NY. Dr. Tsapok is certified by the American Board of Obstetrics and Gynecology and a junior fellow of the American College of Obstetricians and Gynecologists. She also holds many certifications, including Basic Life Support, Newborn Advanced Life Support, and Advanced Cardiac Life Support certifications. Dr. Tsapok’s medical career is colored by many outstanding contributions to the discipline of obstetrics and gynecology. Her achievements are such that she has been named one of America’s Top Obstetricians and Gynecologists consecutively since 2012. She was also named one of a handful of 2013 Leading Physicians of the World. Phenomenal service & a caring physician! The midwife I saw was wonderfully communicative and pleasant. I felt very comfortable in her care. Amazing! I felt so comfortable and at ease. All my questions were answered and they were so thorough. I'm switching doctors! They are really nice just take too long. Amazing staff ! So friendly and made me feel so comfortable! Definitely coming back here! Loved the doctor and the staff so much I've decided to make this my primary care team. I was able to also see a medical doctor and a physical therapist. Am scheduled to see a cardiologist and a podiatrist as wellas a psychiatrst,dietician and a diabetes specialist. Would highly recommend. I've been to this doctor's office several times and I've always had a pleasant experience. Very courteous and professional people. The woman that took my blood pressure had to take it three times because she couldn’t get it right. My arm was purple from the machine and numb. Very unprofessional. The bathroom had dried Pee on the sink. Disgusting. Best customer service in a doctors office ever . From the front best to all technicians to the doctor . Would definitely recommend. This clinic is simply awful. Do not waste your time by seeking help here unless you are in a desperate situation. After waiting for over an hour, I was told that the doctor I made the appointment with is not atthe clinic so somebody else is about to see me. We are talking about a gynecological examination. I'm not comfortable with whomever available to examine my body. It was a good appointment but parking is a big issue. Answered all my questions, extremely professional, would definitely recommend! She was very kind and personable. Amazing doctor. Veey soft spoken and great bedside manor. I was very happy and comfortable and will be returning! The visit was very thorough, all staff members were extremely polite and helpful. The doctor answered all my questions, all necessary procedures were done in a fast and professional manner. A very good visit indeed. Dr.Tsapok and the entire staff made me feel very comfortable, and answered all my questions. I was seen right away!! Everything(blood work, sonogram) was done right in the office. Dr. Tsapok was very professional and informative. It was my first time and she talked me through it step by step, which eased my nerves a lot. Overall, the experience was good. She was amazing! Really happy I met her. Will continue to come here. I am so happy to have found this office through zoc doc. She was amazing, the entire staff was so kind and welcoming, they were all multitasking being that the office was very busy but not once did anyone get stuckstanding around un-attended. Nothing was rushed, each patient was given time and respect and that is so important!!! parking is a bit hard, so if you can get someone to drive you- thats your best bet. The staff and doctor were very friendly but the wait time is unbelievable. I also dont like that I dont have an option to get my results on the phone. Had to make a new appointment just to get results. Andthe second visit wait time was just as long. Again they are very friendly and seem to really care about whats best for you but the wait time I can never do again. I went in this office with a breast lump. The way time wasn't that bad, but I was there early, and they didn't see me at my appointment time. The staff in the from at 42 Richmond, I believe that's theaddress, can't recall. They are very sweet. I love them. I have not one Negative thing to say about them. They were attentive, and sweet. But once inside, Dr Isolda seemed misplaced, not organized. They all helped me that day immediately, they did a full check up. But, they left me waiting in the Sonogram office for about 20 minutes. They didn't apologize once they returned. Dr Isolda was also managing the front desk at one occasion, very disorganized. The system was down, and she had no idea when I could get my prescriptions. She sometimes writes names of doctors in the back of my referrals. Not in an organized manner. I have her CVS as the farmacy to send my prescriptions, closer to my home. Once home I received an operated message from Rite Aid, 30 minutes away, saying that my prescriptions were ready for pick up. I called the office, they placed me on hold for 10 minutes or more. When I gave her this information, her response was, I haven't send your prescriptions yet. I asked her when should I expect them at CVS, she said...I don't know...I don't know...I don't know. 3 times. I had to say thank you, and goodbye. I was so disappointed. The later I received another automated message, stating now, that my prescriptions were in CVS. They have 2 offices in Staten Island. The other one is newer, the newest one is even worse. I went in for an appointment at 6pm. I started noticing that the women there were not happy with the wait time. I found one Spanish woman pacing, back and forward, talking on her cell. I spoke to her in Spanish and asked her, How long have you've been waiting? She had been there from 3pm, to 7pm now. Too much, too long. Another angry mother came out with her daughter, upset in the front desk, and arguing about the wait time. The front desk, does not apologize, they will put you in your place. Not ok. I recommend a different office. I had one Doc, Nick named Mila, who was an Angel. She was lovely. The rest, no good. Look for a better place with better references. I Love it I'm actually excited to go back, all the doctors and lady's that work here are so welcoming and pleasant. Its acutally better then my normal doctor! Everyone was very friendly. I am very happy I found this office. Highly recommended! Dr. Tsapok is a wonderful doctor. Everyone at the office was very professional and polite.. Very fast. They did not make me wait at all! Very very helpful and I felt like they really cared about my health. Staff is great the wait is a little long but it's well worth it I can't wait to go back ! Excellent service, sweet staff, fast service and excellent communication skills. Everyone that works here is SUPER friendly and makes you feel at home! This doctor was always so sweet and comforting. I would continue to see her if I hadn't moved.